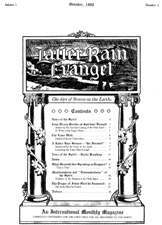 The Latter Rain Evangel was published monthly by the Stone Church, the significant early Pentecostal congregation in Chicago founded by William Hamner Piper. The Stone Church hosted the second General Council of the Assemblies of God in November 1914 as well as the 1919 General Council. The Latter Rain Evangel is an important source for early Pentecostal theological articles, news, missionary letters, and revival reports. The periodical reprinted many early Pentecostal leaders' sermons delivered at the Stone Church. Anna C. Reiff was the longtime editor of the magazine. It ceased publication with the June 1939 issue, merging with The Gospel Call published by the Russian and Eastern European Mission.